Richardson RFPD, Inc. announced recently the availability and full design support capabilities for a new multiple input and multiple output, RF transceiver from Lime Microsystems. The LMS7002M is a fully-integrated, multiband, multi-standard, programmable MIMO RF transceiver. It combines low noise amplifiers, driver amplifiers, mixers, filters, synthesizers, receiver (RX) gain control, transmitter (TX) power control, and analog-to-digital and digital-toanalog converters into a single 11.5 mm x 11.5 mm QFN-packaged product, requiring few external components. It covers 30 to 3800 MHz (0.1 to 3800 MHz when extended by transceiver signal processor numerically controlled oscillators), with 0 dBm Pout from the driver amplifier, and 2.5 dB noise figure at 2 GHz at the RX input. 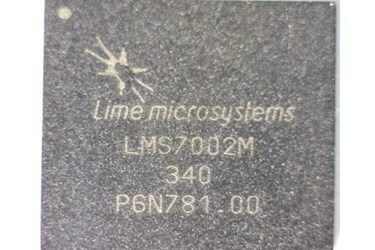 The LMS7002M is well suited for a range of applications, including broadband wireless communications, avionics and defense, 3G and 4G cellular infrastructure, software defined radio (SDR), cognitive radio, unmanned aerial vehicle (UAV), and WiFi operating in the whitespace frequencies, as well as other whitespace applications. An evaluation kit (UWCT7002) is also available. To find more information, or to purchase this product today online, please visit the LMS7002M webpage. Please find a local sales engineer (worldwide) at Local Sales Support. 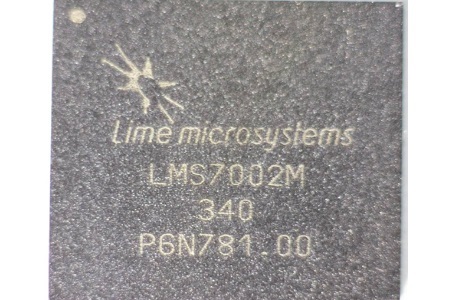 To learn about additional products from Lime Microsystems, please visit the Lime Microsystems storefront webpage. Richardson RFPD / Arrow RF & Power, an Arrow Electronics company, is a global leader in the RF and wireless communications, power conversion and renewable energy markets. It brings relationships with many of the industry’s top radio frequency and power component suppliers. Whether it’s designing components or engineering complete solutions, Richardson RFPD’s worldwide design centers and technical sales team provide comprehensive support for customers’ go-to-market strategy, from prototype to production. For more information, visit www.richardsonrfpd.com.